Rocky and technical with a lot of twists and turns. Some short tough climbs. A great after work workout to build strength and technical skills. Lots of cool bridges and all designed specifically for mountain biking. Opened in October 2010. Rated intermediate/advanced trail. Review: I love this trail because its close and its super natural. Review: Rocky and challenging with short, steep climbs & descents, and tight turns. Full suspension will make this trail more enjoyable. Review: It's an extremely rocky trail. Rocks the entire way. 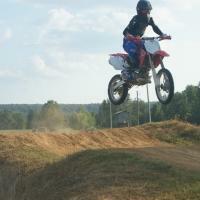 Couldnt finish out of fear of tearing up my bike and having to walk back. MUST have a really good full suspension with really good pressure settings and low gearing. This is NOT your average MTB trail. Review: This trail is tough. Not for beginners and not a lot of fast sections. Review: Miserable. This has got to be the least enjoyable trail I've ever ridden. The landscape is so promising, but I feel like they avoided every beautiful natural obstacle. If you love riding at 3 miles an hour over jaw chattering rock gardens, this trail is for you. Otherwise I would avoid it. No berms, rollers, jumps or drops. Just confusing winding rock gardens for 6.5 miles. Review: An entertaining ride... intermediate riders will probably enjoy it the most as the rock gardens will provide some challenge. I rode this trail while passing through AR, and due to the falling sunlight I basically rode it as fast as possible the entire time, ripping through rock gardens at full speed... The twisty nature of the trail will slow you down somewhat but taking a good line will keep your speed up. 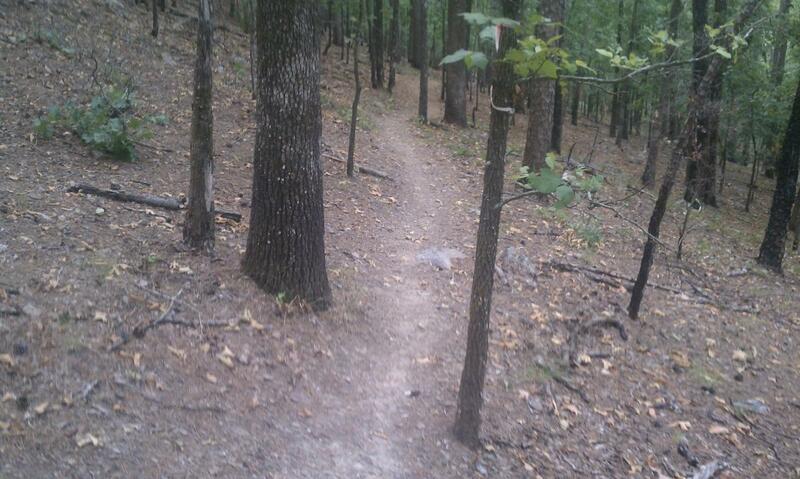 It's a well designed trail for what they are working with, and overall it's a place I'd go back to ride again. Review: A descent ride. I had a cheap bike so it wasn't as fun but overall it's a fun trail. Review: As of July 2014, this track needs some SERIOUS love. There are trees down everywhere and so much pine straw on the ground it can be hard to see the trail. This is easily the most difficult trail in central AR. There is LOTS of climbing either way you start, and a bunch of chunk. It is a slow track as well- there really aren't any places to build up speed. If you want to work on strength and endurance, then this is your place. If you want to have fun with some friends and go fast, go to Burns Park. Review: Rock gardens, up the hill, rock gardens, down the hill, rock gardens, up the same hill, repeat countless times. If you really, really like rock gardens, look no more. This is your trail. Considering all the rock gardens, it's not a very hard trail. But you could get yourself hurt if you crash in the wrong place. I've given this trail two chances, and I will not be back. Review: I enjoyed the ride, but not for beginners. Huge rock gardens. If you go counter-clockwise then you will encounter almost a half mile at the beginning. After that, you will encounter them throughout the ride, but much shorter sections. Very hard to keep any speed going though, especially on the climbs due to the rocks. Overall, it is a fun trail. Jackfork Trail MTB Trail 3.25 out of 5 based on 16 ratings. 16 user reviews.